Disclosure: This post contains affiliate links. All formed opinions are my own and sincere. Want to bring some spice to your life. Not the spice girls spice... Some realy spicy snacks you don't want to miss! 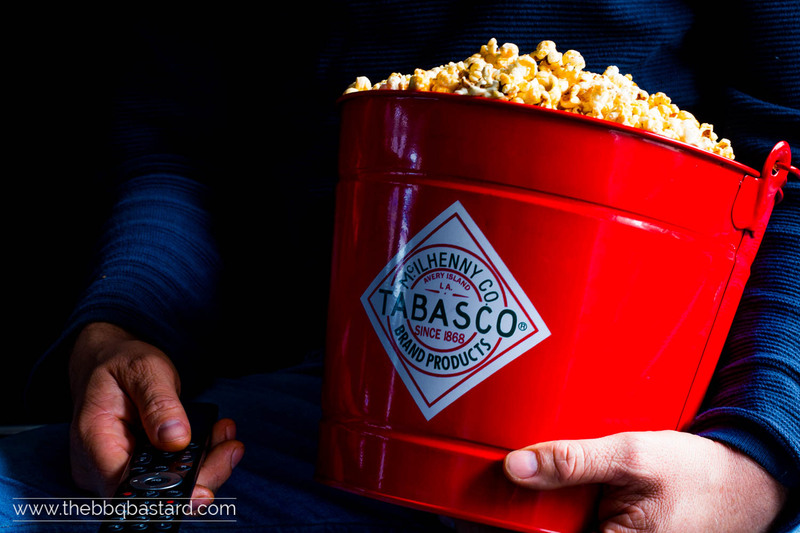 To celebrate Tabasco's 150th birthday I've made a twist on their popcorn making it hotter than those made by the brand itself and flavored it with a delicious butter caramel. Your guests won't expect this kind of heat from the innocent looking goodies you'll serve them! Take a fireproof saucepan and add the butter to the pan. Let the butter melt on a medium heat. You'll see some foam on top of the butter once it's heating up. Take a spoon to remove the foam and let the butter slightly brown until it's starting to smell like nuts. Carefully add a tablespoon of Tabasco (use Chipotle Tabasco for a payable alternative) to the Beurre Noisette together with 2 Tablespoons of agave syrup and 1 tablespoon lemon juice. Warning: be careful while doing this stage since some hot drips might splash around. So make sure no kids are nearby. Let the caramel cook through while gently stirring. Add the cumin, paprika and fennel powder while stirring. Once the caramel starts to stick it's ready. Set aside to cool down a bit while popping the corn. Add 1/2 tablespoon coconut oil to a small fireproof pan with lid and put it on top of a medium fire. Once the oil is molten gently add 1/2 tbsp tabasco! Beware for splashes! Add half of the mais kernels to the saucepan and put the lid back on top with a small opening. Listen carefully to the popping sound of the corn. 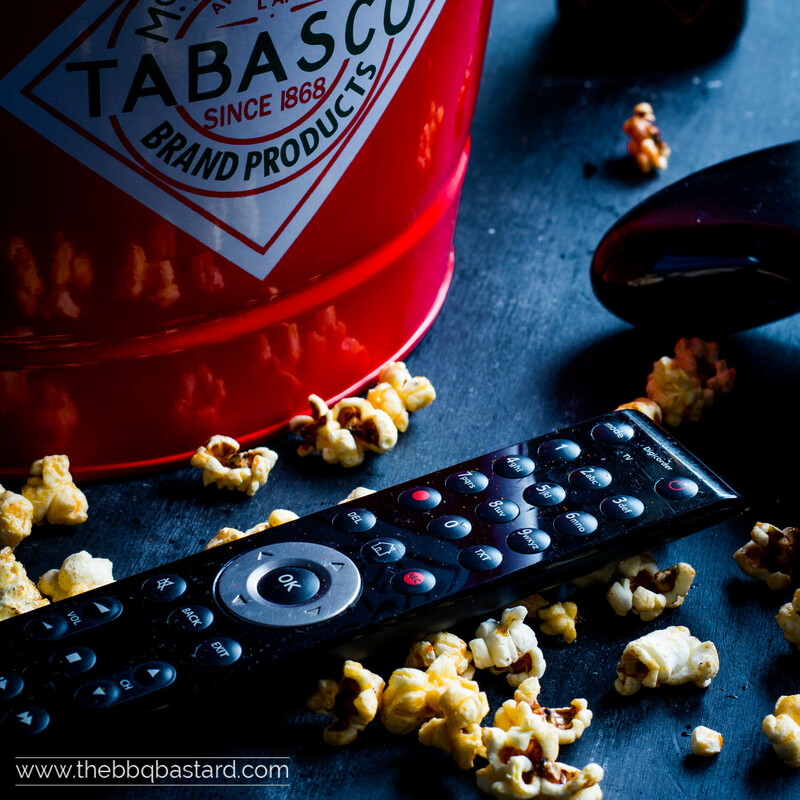 Once the popping sound is slowing down, remove the pan from the fire and toss the popcorn in a bowl or deep dish. Repeat the steps with the other half of the popcorn. Drizzle the spicy butter caramel on top of the popcorn and mix through thoroughly to make sure every piece of popcorn is covered in the lovely caramel. Serve lukewarm or let cool down before. Have fun making this recipe! Please take a moment to leave a comment with your feedback on this recipe when you did! Note 1: don't make to much popcorn at once! Devide your work into small batches if you want to make a lot of popcorn. The more kernels you use the more of them will be burned before the laste ones are popping. Note 3: put the lid on the pan with a small opening to give the air some place to escape. This way the popcorn will remain crunchy. Moreover, in my experience the popcorn popped faster this way.